Can't be explained better than Pope John Paul II did in his 1978 Christmas message. Meditate on this in connection with someone you are in relationship with. You cannot be in proper relationship with God, without being respectful of the dignity of each person whom He loves infinitely. Also, in Christifideles Laici, he notes that assaults on the dignity of the person as the sins that cry out to heaven for vengeance mentioned in Scripture. 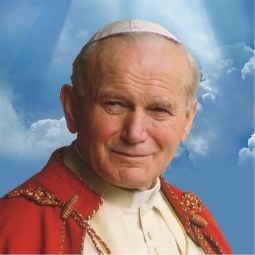 "The dignity of the person is manifested in all its radiance when the person's origin and destiny are considered: created by God in his image and likeness as well as redeemed by the most precious blood of Christ, the person is called to be a child in the Son and a living temple of the Spirit, destined for the eternal life of blessed communion with God. For this reason every violation of the personal dignity of the human being cries out in vengeance to God and is an offense against the Creator of the individual." "By his incarnation the Son of God has united himself in some fashion with every human being. This saving event reveals to humanity not only the boundless love of God who "so loved the world that he gave his only Son" (Jn 3:16), but also the incomparable value of every human person." Hint: The secret to understanding the principle of the common good is to think of "common" as applying to every and therefore to each person without exception, and "good" as that which contributes to human flourishing. Now you can see how this principle is the foundation of human rights. Every human right protects a common good. "The common good comprises the sum total of social conditions which allow people, either as groups or as individuals, to reach their fulfillment more fully and more easily". A society that wishes and intends to remain at the service of the human being at every level is a society that has the common good — the good of all people and of the whole person* — as its primary goal. The human person cannot find fulfilment in himself, that is, apart from the fact that he exists “with” others and “for” others. The common good consists of three essential elements: respect for and promotion of the fundamental rights of the person; prosperity, or the development of the spiritual and temporal goods of society; the peace and security of the group and of its members. "The dignity of the human person requires the pursuit of the common good. Everyone should be concerned to create and support institutions that improve the conditions of human life." This principle establishes the family as the first cell of society -- the first church, and the first school of love, peace and justice. All structures in society must be judged by how well they support the family. "The "principle of subsidiarity" must be respected: "A community of a higher order should not interfere with the life of a community of a lower order, taking over its functions." In case of need it should, rather, support the smaller community and help to coordinate its activity with activities in the rest of society for the sake of the common good." The rights of the family are not simply the sum total of the rights of the person, since the family is much more than the sum of its individual members. Whenever the family is self-sufficient, it should be left to act on its own; an excessive intrusiveness on the part of the State would prove detrimental and would constitute an open violation of the rights of the family. Only in those situations where the family is not really self-sufficient does the State have the authority and duty to intervene." Solidarity is much more than charity. It is the application of treating the other as another self. It is looking at another and not turning away, but taking an intererst in the origin of his or her condition. Fr. Thomas Williams, LC on Principles of Catholic Social Teachings.